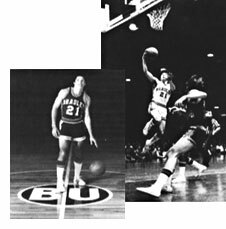 Bobby was only a sophomore in 1972 when he played for the Manual Rams in the Class AA lHSA basketball tournament. They finished 4th. Bobby was a little-used guard then, giving a starter named Wayne McClain an occasional breather. By his senior year, Bobby was an all-stater. Coming to Bradley, Humbles slowly made his mark as a starting guard. By his junior season, he teamed with a walkon named Roger Phegley to become one of the three best backcourt tandems in Bradley basketball history. Bobby ended his four-year Hilltop career as the Braves' 10th leading scorer with 1,262 points. During the 1976-77 and the 1977-78 seasons he led the team in assists and in 1977-78 he led them in steals. In 2003, Bobby Humbles was named to Bradley's all-l970s squad. Jack Brickhouse, in a remarkable career which has spanned 45 years and over 5,000 Major League baseball broadcasts, has received virtually every honor the broadcasting profession has to give, including the nation's "Best Sports Announcer" award by the American College of Radio Arts and Sciences. A local product who was educated in the Peoria school system and at Bradley University, Brickhouse went on to great things at WMBD radio in Peoria before being hired by WGN in Chicago in 1940. He first gained prominence in broadcasting the games of Bradley's Famous Five in the late 1930s. 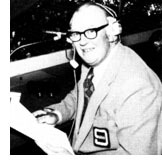 Brickhouse soon became the number one announcer of Chicago Cubs baseball before short stints in the United States Marines and as a broadcaster in New York. In 1947 he returned to Chicago where he broadcasted White Sox games from 1948 to 1967 and Cub games from 1948 through this past season -- in all, more than 5,000 broadcasts. And in the process he became Vice President and Manager of Sports at WGN, the leading independent station in America. That number alone puts Brickhouse above most other broadcasters in America, but dedication and professionalism will be the reasons he will rank as one of the best in the history of athletics. Jack will always be remembered as a man who took pride in his roots and never forgot that Peoria and Bradley University gave him the start to a career which earned for him the respect of millions of sports fans.